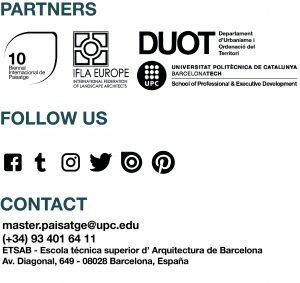 INTERNATIONAL INTERSHIP – Master in Landscape Architecture Barcelona – Universitat Politècnica de Catalunya – 35ª EDITION. The master focuses on planning, desing and managment of landscape proposals to train the students professional preparation. The international teaching staff accompanies the students throughout the process, from their experience in the professional field, and trains them to present and defend the project properly.